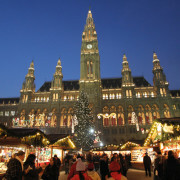 At the traditional Vienna Magic of Advent, the Rathausplatz becomes a shining fairytale land. The 150 or so sales booths at the Christmas market offer Christmas gifts, Christmas tree decorations, sweets and warming drinks. The trees of the surrounding City Hall park are festively decorated and radiate in a sea of lights. There are lots of offers here for children in particular, such as a carousel and craft fun in the Christmas Workshop. Not far away is the Christmas Village on Maria-Theresien-Platz, situated between the Museum of Fine Arts and the Natural History Museum. Over 70 booths offering traditional handicrafts and original gift ideas are set up here during Advent; the Christmas Village is replaced by the New Year’s Village on 27 December. The romantic Christmas Village in the Old AKH is also a popular meeting point during the run-up to Christmas, especially for the younger crowd. There are two curling lanes right in the Christmas Village. The Old Viennese Christmas Market on Freyung in the city center is committed to tradition. A Christmas market was held here as early as 1772; today, it is a place to buy handicrafts, glass decorations, traditional cribs and ceramics. Festive Advent music can be heard on the square from 16:00. Top-quality handicrafts can also be purchased a couple of steps further along at the Am Hof Advent Market. The cultural and Christmas market in front of Schönbrunn Palace offers romance in front of an imperial backdrop, and is converted into a New Year’s market after Christmas. The atmospheric market offers traditional handicrafts, hand-made Christmas decorations, Christmas concerts and an extensive children’s program, including Christmas workshop. The Christmas Village at Belvedere Palace enjoys an impressive baroque background. The unique palace gardens provide an ideal site for a tranquil Christmas market. Art Advent on Karlsplatz offers a diverse children’s program and above all handicrafts to buy. 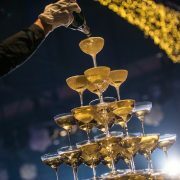 Further variety is provided by art installations, live bands and street theater. There are also numerous stalls full of artisans’ wares in the idyllic tiny alleyways at the Christmas Market on Spittelberg and numerous other vendors with unique culinary gift ideas. This year for the first time, there will be a Christmas post office here with its own Spittelberg Christmas stamp. Entertainment is the word at the winter market on Riesenradplatz. There are children’s adventure rides, musical live acts and a humorous show program here until 6 January. The Christmas market at Stephansplatz focuses on contemplation and tradition, with 26 booths offering high-quality products from Austria. A very special Holy Mass with the Hofmusikkapelle and the Vienna Boys’ Choir and members of the State Opera orchestra and men’s choir. Sun. 18 Sep 2016, 9:15 a.m.
Sun. 25 Sep 2016, 9:15 a.m.
Sun. 02 Oct 2016, 9:15 a.m.
Sun. 09 Oct 2016, 9:15 a.m.
Sun. 16 Oct 2016, 9:15 a.m.
Sun. 23 Oct 2016, 9:15 a.m.
Sun. 06 Nov 2016, 9:15 a.m.
Sun. 13 Nov 2016, 9:15 a.m.
Sun. 20 Nov 2016, 9:15 a.m.
Sun. 27 Nov 2016, 9:15 a.m.
Sun. 04 Dec 2016, 9:15 a.m.
Sun. 18 Dec 2016, 9:15 a.m.
Sun. 25 Dec 2016, 9:15 a.m. The Viennale is Austria’s most important international film event, as well as being one of the oldest and best-known festivals in the German-speaking area. Every October, the VIENNALE takes place in beautiful cinemas in Vienna’s historic centre, providing a festival with an international orientation and a distincitve urban flair. A high percentage of the approximately 65,000 visitors to the festival from Austria and abroad is made up of a decidedly young audience.